Julia asks: Hello! I’m a college student considering field biology, even primatology. If you have anything to say (good or bad) about your line of work, I would love to hear it… like what your day to day is, how often you are in the field, and what you do when there. Anything would be appreciated! Hi Julia! I love my work and feel lucky to have such an interesting job. I don’t really have any bad things to say about the day-to-day, but there are certainly aspects of the job that make it not suitable for everybody. By its nature, research deals with questions that have not been answered, and oftentimes the reason that they have not been answered is that this is really really really hard to do. First, you need funds, so much of your time is spent competing with others for a very limited pool of available grant money. To get grants, you need qualifications (see my friend Evopropinquitous’ blog for some excellent advice), which will mean that you will probably be balancing your research activities with some combination of studying or teaching. Next, once you have your funds and make it to the research stage, so many things can and do inevitably go wrong. Perhaps political instability in your country of research makes it impossible to obtain visas or permits (not to mention can be really scary). Perhaps the animal group that you study disappears during your study period due to habitat destruction or any number of other reasons. Perhaps you complete your study and triumphantly make it back to civilization only to lose all your data to theft at your favorite hostel. Perhaps you get malaria. Quick aside here. You asked about bad things about this line of work. Fieldwork can and should be one of the best parts about this job, but it can also be a nightmare when combined with bad, inexcusable behavior from colleagues. Unfortunately, a recent survey of researchers, especially women, who do fieldwork reveals that this is unacceptably common (please see Kate Clancy’s blog for more about this). I have never personally experienced abuse, but I do believe that the same isolation that makes fieldwork a delightful, insightful experience encourages bad behavior in some and makes it particularly traumatic for victims. I can’t offer you much advice here, except to be vigilant regarding who you work with and to always feel comfortable with your fieldwork plans before you begin. Things do go wrong, but research still gets done and when it does, the results are incredibly rewarding (the good things start here!). Research opens up new areas of research in ways that are difficult to visualize when you begin your study. Interacting with all sorts of different people can lead to opportunities you never dreamed you would have. Fieldwork helps you understand yourself a little better, and has taught me, at least, to help accept setbacks with patience and humor (write it all down for your autobiography one day!). The parts of your job that involve interacting with students, colleagues, and the public can also be rewarding, but also be prepared to accept that not everybody will be interested in your work. Finally, you asked about what I do in the field. I am at the stage where I am just beginning my Ph.D. dissertation fieldwork. 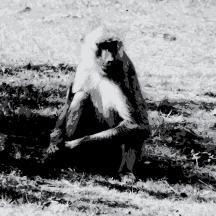 My project deals with hybridization (interbreeding) in two species of baboons. When ranges of different species come into contact and hybridization occurs, alleles (one of two or more variations of a gene) are exchanged and, through time and matings, can make their way further into the ranges of species where they were previously absent. I study the genetic patterns that result from hybridization, so my study area is quite large and involves many groups of baboons. Because of this, I do a lot of driving, looking for baboon groups and sampling their genetics. At the moment, I am writing this from Zambia, where I am figuring out the logistics, so much more on this later! This entry was posted in Mailbag. Bookmark the permalink.